Stretchy, Stringy, Glow in the Dark Fun! 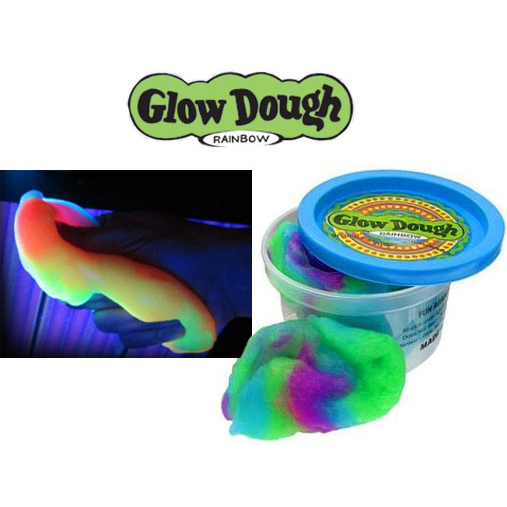 This soft and pliable dough comes in a rainbow of glowing colors, packed in each 4 ounce container. Safe and non-toxic. Rainbow Glow Dough comes in various striped color combinations. Expose Glow Dough to a light source and then see how it glows in the dark. In just a few seconds Glow Dough is ready to glow and have fun with! Glow Dough products are non toxic, water-based and stain free. It is a soft, pliable dough that you can pull, twist, bounce, wrap and stretch. If kept in its container while not in use, it will stay soft and can be used again and again. We take great care to insure the quality and safety of our products. We would never recommend you eat it, bathe in it, wash you car with it, use it as a hair gel, but we can tell you it will provide hours of endless fun and all the creative ideas are up to you! We would love to hear what you have done with this product to entertain you and the ones you love! No, it's not a miracle drug, but it sure is fun to play with! It has been said that laughter is the best medicine!